Ilinalta's Deep is a medium-sized Imperial fort that mysteriously collapsed. It is located on the northern banks of the western side of Lake Ilinalta, within viewing distance of the Lady Stone. 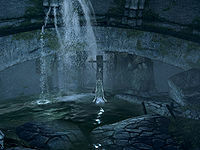 It has two interior zones: Ilinalta's Deep and Ilinalta's Deluge. In the entrance, you will find a shackled skeleton; the knapsack at his feet contains a fisherman's journal that reads "Folks say it's cursed. Whole Imperial Fort just sank into the water one day, and they say the ruins have been haunted since." This is a partially sunken fort with only one tower and a few stretches of wall still visible. The entrance is through a trapdoor on top of part of a wall. There are several mudcrabs either side along the lake shore. There is also a silver ore vein, a corundum ore vein and an iron ore vein nearby. A short distance northeast of the fort is the entrance to South Brittleshin Pass. When entering, you will see a shackled skeleton with a knapsack at its feet. Past the shackled skeleton in the entrance, you will find a larger room with a balcony that is, for the time being, out of reach. The only passage available to you, on the left, leads to a small library. 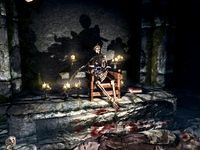 A necromancer is found sitting at a table, with a companion skeleton. If he detects you, the necromancer will call for support from the next room, and a few more necromancers will join the fight. There are several bookcases around the room holding fourteen common books, five bottles of wine, a salt pile, a bowl of bone meal and a few sacks of food. On the table the necromancer was sitting at is a random potion of healing, a random potion of magicka, a random potion of extra magicka, an iron dagger, several soul gem fragments and a rare human heart. The adjoining room is a dining room with several long wooden tables joined in a horseshoe, laid with two salmon steaks, two baked potatoes, and two rock warbler eggs. There is also a vase with a snowberry bush growing from it and large fireplaces at either end of the room. Opposite the entrance is another door leading to kitchen area guarded by a skeleton. There is a pot hanging over the fireplace and counters against the walls around the room. On the counters are a fillet of salmon meat, two raw rabbit legs, a charred skeever hide, a potion of regeneration, a potion of health, a random potion of waterbreathing, random potion of stamina, two loaves of bread, and a pheasant. There are a couple of racks hanging from the ceiling holding a garlic braid, a bunch of dried elves ear and a rabbit, as well as two food barrels in the southern corner. Continue through the halls, and you will soon find yourself in a flooded room where a skeleton and a necromancer will be ready to summon a wolf if he spots you. There is an unlocked chest along the wall on the dry side of this room and beside this a cupboard holding only clutter. If you dive into the flooded part you will find a submerged bedroom with a second chest and a copy of the Alteration skill book Breathing Water floating up to the room's ceiling on the left as you swim into the room. There is a door on the far side of the room heading east. The next room is guarded by a single skeleton and contains several unowned single beds that have been jumbled together and in the northwestern corner is a large collection of kettles with a random sword among them. In the center of this room, sticking out from fallen masonry is a loot-able skeleton's hand. A passage leads further to the east. At the end the passage turns to the south and opens into a room with an alchemy lab and arcane enchanter. There may also be a pair of necromancers there as well, and any noise while fighting these can alert a couple of skeletons and a leveled necromancer—one of which will raise a bandit to assist—and a highest possible leveled necromancer from the rooms ahead; this can lead to a challenging battle. On the left is a set of shelves holding a common book, a random empty soul gem, a random potion of magicka, and a bowl. Beside the shelves is a long wooden table, where one of the necromancers was sitting. On the table is a copy of the Enchanting skill book A Tragedy in Black, a horker tusk, several soul gem fragments, a random empty soul gem, and a random potion of magicka. An iron dagger may be found under the table. There is an apprentice-locked door on the west wall and an unlocked door opposite on the east wall. To the left of the first door is the alchemy lab. Further along the west wall is a cupboard with an apothecary's satchel, a bowl of frost salts, and a bowl of fire salts on a shelf. Beside this is the arcane enchanter. In the southeastern corner is a bookcase holding four common books and a copy of The Aetherium WarsDG, a sprig of snowberries, a bunch of lavender, and a random potion of magicka. To the right of this is a passage heading south. At the end of the passage it turns to the west before entering a room on your right, with a small table holding a bottle of wine in front. The room is split down the middle by water with a bridge against the western wall. If the previous battle didn't alert the master level necromancer and skeletons from this room the bridge will be raised. There is a set of shelves holding two random potions of extra magicka on the right, while around to the left in the southwestern corner are two sets of shelves holding clutter with five loose pieces of firewood and a woodcutter's axe between them. On the far side of the bridge is an altar with a skeleton laid out on top with a random dagger and random filled soul gem beside it. To the left is the boss level chest and a chain to lower the bridge. If the bridge is raised you will need to swim across to reach the chain to the left of the altar. 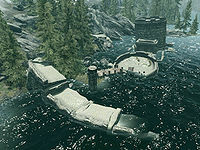 Under the water are two skeletons that can be looted for a few septims each and an adept-locked door to an alcove containing a set of shelves holding a random potion of healing, a random potion of magicka, a small coin purse, and two loose septims. There is also an unlocked chest in front. In the northwestern corner is a wooden door heading west which turns to the south after a couple of paces. At the end is a cupboard in front of you with various human bones on the shelves and the passage is staggered to the right. 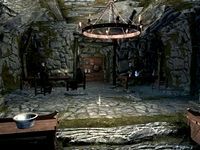 There is an apprentice-locked wooden door on the west wall that opens into a storeroom with two barrels of ingredients and two sets of shelves holding a random potion of healing, a random potion of magicka, and a random potion. The passage leads to a flight of stairs leading up. At the top the passage turns to the west and ascends a second flight of stairs to a wooden door barred on this side. Through the door is the balcony seen in the second room at the start. To your left a pillar has fallen over allowing access to the exit. On the balcony are three empty sets of shelves and an empty long wooden table. There is a wooden door down a short passage with a stream running from beneath it to drop below as a waterfall. It leads to Ilinalta's Deluge. Through the door is a passage that takes a couple of turns and descends a flight of stairs before opening up into a large room. 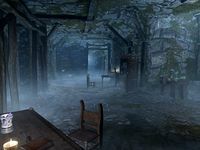 As you approach you will hear two necromancers discussing a failed experiment and the requirement to find someone to sacrifice; they are both sitting at a table opposite where you enter this room. There is a wooden table on your right as you enter with a bottle of Nord mead on top. A copy of the Conjuration skill book The Doors of Oblivion can be found on the table where they were sitting. Additionally both tables at the rear of the room have some soul gem fragments, and each has a random soul gem—one empty and one filled—as well as a random potion of magicka on top. Between the tables is a cupboard with a random empty soul gem and three common books. There are also two barrels of ingredients and two dressers in the room. In the northwest corner is an unlocked chest. To the west is a passage and to the east a door to a storage room that contains three sets of shelves; one contains three random potions of healing, magicka or stamina, one contains a couple of random healing potions, and the third contains seven common books. The corridor turns to the north and descends a flight of stairs to an unlocked door. The next hallway has a leveled necromancer and skeleton patrolling and contains six empty prison cells, four of which have adept locks. The following room contains another leveled necromancer and is partially underwater. The necromancer will raise a few skeletons to aid him as soon as he is alerted to your presence. It has a raised area the necromancers have been using for sacrifices; there are quite a few broken skeletons you can search for gold and bone meal. Curving stairwells lead up towards the next room, or down into the water. At the bottom of the water are a couple more lootable skeletons. 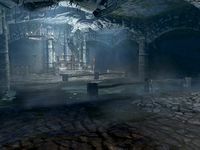 The final room contains Malyn Varen's skeleton, Azura's Star, Malyn Varen's Grimoire, a couple of lootable skeletons and a chest, along with a ladder that leads outside to the top of the mostly intact tower in the lake. Even after starting the quest The Black Star, the path to Ilinalta's Deluge and Azura's Star may be blocked by a large boulder. Exit and reenter the dungeon and it should disappear, allowing access to the door beyond. The entrance hatch to Ilinalta's Deep may be missing (i.e., your quest arrow points to stone). A possible fix is to fast travel to another map marker (Fort Greymoor to the northwest is the closest), then fast travel back to Ilinalta's Deep. The entrance will be accessible this time. Despite the hatch not being present, you still might be able to interact with the spot where the hatch would be to enter Ilinalta's Deep (i.e., where your quest arrow points). Going back out may then cause the entrance to properly appear. This page was last modified on 12 April 2019, at 19:59.